If you are looking for affordable car wrap services you have come to the right place. As well as all our other services including paint protection film and ceramic coatings, Window Tinting UK also carry out vehicle wrapping and bespoke customization which can transform your vehicle. We operate throughout the entire South and South West of England including Cornwall, Devon, Dorset, Bristol, Wiltshire, Hampshire, Surrey and West Sussex. Furthermore, our professional vinyl installers can come to you, saving you time and money. With an extensive choice of vinyl car wrap, you can now both protect and customise your car to suit your style. So, if you are looking for car wrapping at competitive prices, speak to the experts at Window Tinting UK. Why have a vinyl wrap? Having a car vinyl wrap can completely change your car or vehicle in a matter of hours. 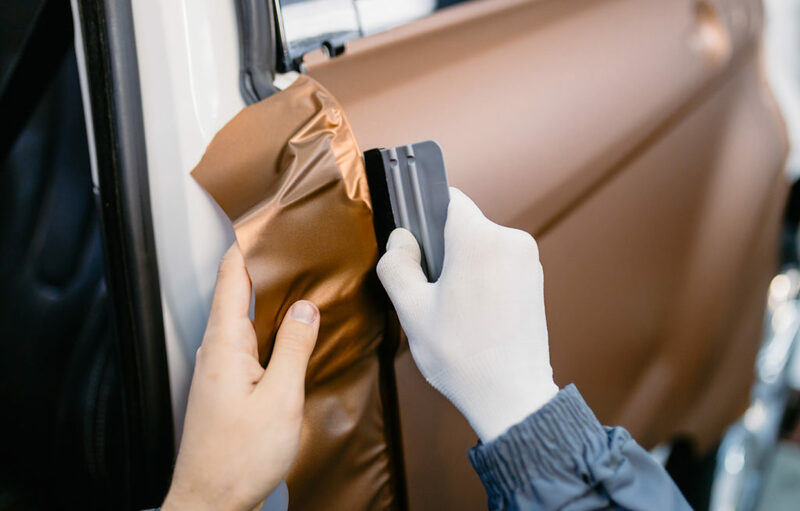 Unlike spray-jobs, a vinyl wrap can be removed quickly and easily so you can revert to the original paint finish, which is ideal for cars on PCP or lease deals, meaning the vehicle can go back to standard in moments. How does vinyl car wrap work? Our specially certified vinyl installers apply vinyl car wraps using a specialist self-adhesive vinyl. The vinyl is gently heated and stretched over the car bodywork, with the temperature constantly monitored using a laser thermometer. The lines of your vehicle are followed meticulously to provide a flawless finish. With no visible joins and even at close quarters, the finished product looks just like a professional re-spray. Why choose Window Tinting UK for Car Wraps? We have an extensive selection of some of the worlds best and unique car wrap vinyls. The choice includes gloss and matte colours through to speciality colours such as chrome, flip matte and a very authentic looking carbon fibre. Our car wrap prices are competitive and our team are fully certified vinyl wrap installers. This means you will get a flawless finish at a great price. Why not give us a call for a free quote?